One of the real treats we had on our February trip to the Southeast was found at McDonalds. Back in my burger days (yes, you can read that as pre-heart-attack) I was a solid Burger King man. Just give me a whopper with cheese, please. Once I came to understand "fat grams," that changed and we never do a burger lunch anymore. 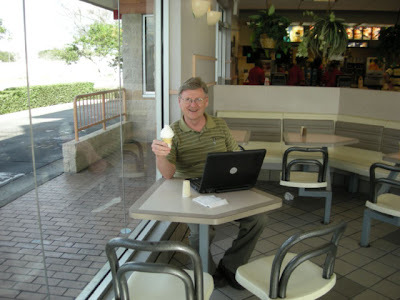 But scrutinizing the nutrition information for several fast food restaurants soon lead me to the McDonald's vanilla reduced fat cone with 150 calories and 3.5 fat grams. A pretty nice afternoon treat on a road trip. Stopping at McDonald's a couple of times on this trip, I noted the "wi-fi available" sign. Checking out the connectivity page, I noticed a "coupon" option. I questioned the manager who handed me a coupon with a code for free connectivity. So my absolutely favorite receipt from the trip comes from a McDonald's for $0.27 This got me a senior coffee (including $0.02 sales tax) and a coupon for an hour of connectivity to publish a couple of blog posts. Some managers currently will give you a coupon, some will not. It appears to be a discretionary policy. Give it a try, just make sure to ask for a manager, your typical counter person won't know what you are asking for.